Shuttle program manager Ronald Dittemore told reporters today they were, in effect, mistaken if they assumed from previous briefings the Columbia disaster investigation was focused primarily on the possibility foam debris from the ship's external tank triggered the orbiter's destruction during entry Saturday. While it's true at least one team of engineers was told to assume the debris was, in fact, responsible - by hitting fragile tile on the bottom of Columbia's left wing 81 seconds after launch - that scenario does not appear to be an especially plausible explanation. 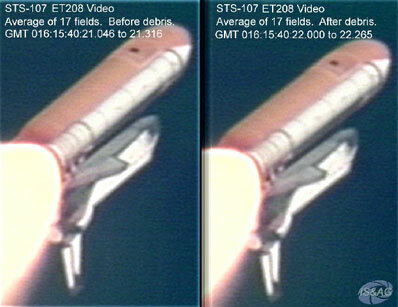 Revisiting an engineering analysis that occurred during Columbia's flight, after film analysis prompted concern about the debris strike, Dittemore said engineers assumed A) the debris measured 16 by 20 by 6 inches; B) that it weighed 2.67 pounds; and C) that the air velocity between the shuttle and the tank was about 1,500 feet per second, or 1,023 mph. In reality, he said, the relative air speed as about 750 feet per second, or about 511 mph. The assumed dimensions and weight were conservative estimates and the data was processed by modeling software that over-predicts tile impact damage. The result was a conclusion that the debris impact, which a possible source for wing damage due to entry heating loads, would not have led to a loss of the vehicle. "So it's difficult for us to believe, as engineers, as management and as a team, that this particular piece of foam debris shedding from the tank represented a safety of flight issue," Dittemore said. "So we're looking somewhere else. Was there another event that escaped detection? "As I mentioned before, we're trying to find the missing link and as you focus your attention on the debris, we're focusing our attention on what we didn't see. We believe there's something else. And that's why we're doing a fault tree analysis and that's why we're investigating every area. Right now, it just doesn't make sense to us that a piece of (foam) debris could be the root cause of the loss of Columbia and its crew. It's got to be another reason." Because of recent media attention on the foam issue, Dittemore came to today's briefing with a large chunk of tank insulation. 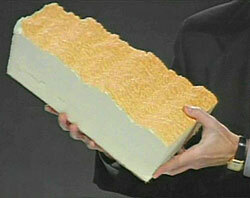 Contrary to recent speculation, he said, the foam is virtually waterproof. He said ice team inspections the day of launch found no signs of any ice buildups on the tank and that in his opinion, the foam did not end up with ice imbedded in it. "It is very lightweight," Dittemore said. "So it's designed to be resilient and be an insulating material to keep the tank cold. It's designed to be on the tank also to keep the structure from getting too hot and it's also designed to make sure we reduce the aerodynamic loads and the flow stream around the tank. "It's fragile, it's easy to break and it's easy to break up into particles. It's very lightweight. ... I don't think there is an embedded ice question here, I don't think this came off as a chunk of foam and solidified with ice. When it hits the wing, this piece of foam disintegrates. Although we're going to look, we did not have icing conditions that day. We didn't have the ice, it's impervious to water. So it's something else. It's something else." It's not altogether clear whether he meant the foam could not have played a role in the disaster or that it could not have played a role without some other contributing factor. In any case, enhanced frames from a tracking camera also were presented today, showing the underside of the left wing before and after the debris strike. While the resolution of the video is poor, there are no obvious signs of damage on the wing. "As you can see it's not very good for any detailed analysis," Dittemore said. "But it does show, as you look at it both before and after impact, there really are no gross large areas of damage. We are attempting to try to improve the resolution of the launch video to see if we can get any better information. But from a gross sense, we didn't see anything that would cause us a concern." In the meantime, the investigation is leaving no stone unturned in attempting to pin down what might have gone wrong. The first telemetry from Columbia showing signs of trouble came roughly eight minutes before the craft broke apart high above Texas. The data show temperature build ups in the left landing gear wheel well and along the left side of the fuselage. An unusual aerodynamic drag developed on the left side of the spacecraft, forcing the ship's flight control system to send commands to elevons and thrusters to keep the nose pointed in the right direction. Eventually, the drag became too much to overcome and the vehicle slipped out of control at a velocity of 12,500 mph. While it's not clear what caused the problem - tile failures, impact by space debris or a micrometeoroid, problems with the carbon-carbon panels on the leading edge of the wing - the result was increased temperatures on the left side of the vehicle and some sort of structural issue that led to an unusual - and steadily increasing - aerodynamic drag. Engineering teams are using the telemetry to "reverse engineer" the problem, trying to figure out what sorts of failures could produce the observed high temperatures, elevon deflections, thruster firings and sensor failures observed in the final eight minutes of telemetry from Columbia. "I talked to you previously about the temperature rise and the loss of sensors along the left-hand wing," Dittemore said. "We are continuing to review that information and are backing out where we believe the heat source would need to be in order for us to have those indications present. So we are performing some reverse engineering, some reverse analysis to try to understand what would be the cause of such temperature rises in the wing. "On the flight control side, we are doing a very similar reverse engineering task and we're modeling the aerosurface positions, we're backing out the drag and the loads that would be required to cause the aerosurfaces to react and the jets to fire. We are continuing to build a fault tree and we have many areas to investigate. We have not narrowed it down to any one particular conclusion or any one favorite topic. We have many areas to investigate." Engineers plan to test external tank foam impacts and tile strength to get a better understanding of the mechanics of such impacts. Others are attempting to coax better imagery from the tracking camera footage. But recovery of debris on the ground could prove the most crucial to the ongoing investigation, especially any debris that fell away from the vehicle early on in the descent. Recovery of any such debris could help engineers determine exactly where the problem, whatever it was, began. "The evidence that we find on the ground, and evaluating it and testing it, will help us point in the right direction, whether it was something that happened ... during the on-orbit phase, was it something that happened during the entry phase or was it something that happened during ascent and we didn't see it," Dittemore said. "Those are all possibilities. "I know a lot of you have focused on the ET shedding of the debris, but we have not. We're looking at all these other areas because they are also possible and we just don't have any evidence to point us in one direction or the other and we are struggling to find that indicator or pointer to help us find that missing link."